The secret to improving your agility for roller derby, is that there’s no one secret. Yes, like so many things in life, you can’t just hit the bullseye with a single dart. Sometimes you need to come at things from multiple angles. I won’t call it a shotgun approach though – because this workout is truly focussed on the three elements I believe are critical to improving your roller derby agility. Thus, I bring you the Agility Sandwich! A delicious hearty centre of precision fast footwork drills, surrounded by two supporting slabs of stability and power moves! Bottom layer: To be agile in roller derby, we need to be able to change direction rapidly, stay upright when hit, and sometimes shift positions midair (sort of a Crouching Tiger, Hidden Jammer move). To improve these abilities, your core stabiliser muscles must be up to the task. That’s why we start this workout with three stability training moves. They’ll test and train your balance and your core strength. The Filling: This is the fast footwork you automatically picture when agility comes to mind – think of all that footage you’ve seen of football players picking their way through lines of car tires on the ground. If it’s good enough for running backs, it’s definitely good enough for blockers and jammers! So the centre of our agility sandwich will be some fast footwork. We will apply a precision element to this effort, remembering that agility is only useful if it comes with CONTROL. Top layer: Jack be nimble, jack be quick, but jack still has to be able to JUMP over that downed player on the track. Not to mention accelerate quickly around an interfering blocker, jump the apex, and have the power left to quickly change directions again to avoid the next blocker. So we top things out with three rounds of plyometric moves – those moves designed to build your power, which will complement your stability and fast feet. You need – a warmup, a timer/stopwatch, and some painter’s tape (something that won’t ruin your floor), or chalk if you’re outside. Set up your fast footwork “dice” before you start the workout – mark out the corners of a square on the floor, approximately 30 inches or 750mm to a side, with a dot in the middle. trace the diagonals of the square to make sure your centre mark is actually in the centre. Check it out in the video to see what this should look like. Part 3: Plyometrics – do each move for 45 seconds continuously, rest for 15 seconds, then on to the next. Repeat the sequence for THREE rounds total. 10m Shuttle run: Start from your belly, SPRINT off the ground and to the end point, then jog backwards to the start point. See the video for modifications if you don’t have the space. Frog jumps: Forward & backward. Back is much tougher – try to get back to your starting point in as few hops as possible. My ratio in the video is 4 hops forward / 6 hops back. Looking for more? Try some of my other agility workouts, like Seven Minutes in Heaven or It’s a Fine Balance. Is there an agility move I haven’t shown you yet that you think I would love? Tell me about it in the comments below! PS: did you know there are tons more workouts like this waiting for you in the RDA Fitness App? 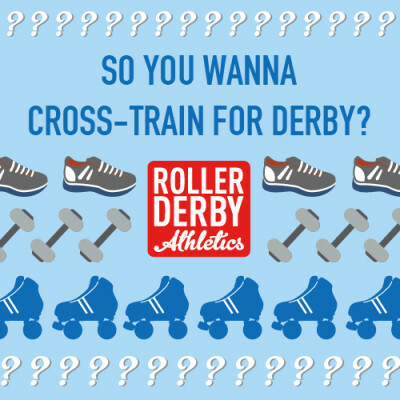 Sign up for a training plan and get your derby cross-training in the palm of your hand. 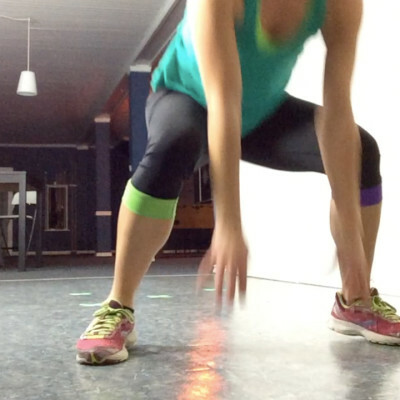 Do you do the entire sequence three times, or only the plyo part? Just the plyo section for three rounds, Sarah!